Oh! Look at those slices of cake! I’m not a big fan of cakes myself (can’t make them and don’t usually care to eat much other than a bite or two), but those slices look so good! Cheese!!!!! I hope you’re having a wonderful trip! I can see some graduate students very happy next week when I make this cake for them. I plan to buy some shredded coconut here in Brazil and take with me just for this cake. I’m like you, give me the savory any day. But this cake takes the um cake. I love the ingredients and the presentation! I would enjoy this cake. I sure did. I suspect my niece has some hidden agenda to fatten me up – she brough a coconut cake yesterday, and I MUST get that recipe too. Amazing cake, simple but delicious. The cake looks moist and luscious, Sally. Thank you for posting this. For me, simple baking is a necessity. Simple baking is the way to go… I bought the right shredded coconut today, and it´s already in the luggage! Believe it or not, we had yet another fuba cake at a friend´s home a couple of days ago. IN her version, she added quite a bit of cinnamon. I thought I had died and gone to heaven. There will be a lot of running in Oklahoma in my near future. Well, I am still exercising quite a bit here, but not enough to fight the excesses, I´m afraid! This sounds so simple and divine. The cheese is interesting – I bet it adds a great goo factor. You got that right, Lynda… the goo factor was awesome! Isn’t it fun when we try new foods that make us absolutely want more, more, more. Look good! I’m having a cornmeal/polenta ‘thing’ at the moment. Trying it in everything, so this is very well timed for me. You know, I want to try it with Mexican cheeses available in the US and will report back on the best type. If you want to try it soon, I advise you to get one of those Cotija type, not too wet, not too dry. I bet it will work well. But I intend to make it next week and add a comment to this post about it. I’d love a slice of this with some tea right now! The layers do look irresistible, and the cornmeal, cheese, and coconut sound delicious. That looks great and the recipe is certainly simple. Safe travels home. THanks, Cindy! We leave tomorrow, today is our last day here, feijoada for lunch at my niece´s home with the whole family, and a dinner with two couples. Busy busy busy day. But a lot of fun for sure! Oi, Angela – minha sobrinha e’ o maximo! Toda semana faz uma serie de bolos, cookies, para a familia dela. Sortudos, nao? What an interesting cake. I’d love to try it. I hope you do, Barbara… that bottom, coconutty layer is to die for! That looks delicious. I’m printing it out for a close friend of ours who spent time in Brazil with the Peace Corps. He will love it. Hi when you say Farmer type cheese, what type do you mean please..? It’s in the oven right now. Man, what a loose batter! You sure this sets up, huh? Guess I’m gonna have to hope those 4 eggs do the trick. Smells GREAT even un-cooked, btw. This looks delicious! I want to try the recipe, but I’m going to have to get an appropriate pan. Can you give me an idea of how big a medium-sized ring pan is? Thanks! Thanks! I tried to google it, but wasn’t having much luck. Thank you, Sally. And thanks for the recipe! I made this cake last month and again today. It’s very tasty… but both times it seems as though it’s way too liquidy. It does not cook in 50 minutes… I had to leave it in for 1 hour and 20 minutes, and it still isn’t quite set. 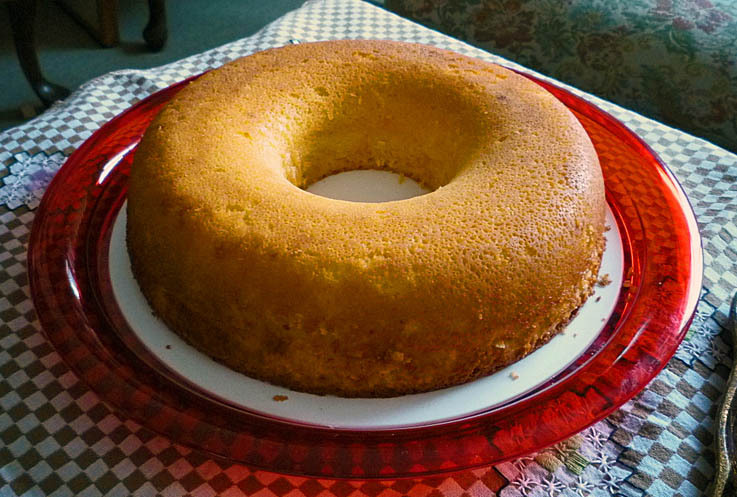 It seems more like a spoon bread or polenta than a cake. I was wondering if maybe there isn’t a typo in the amounts? Is it really supposed to be so much liquid to so little flour?? Once it cools, it does work, even with such a small flour to liquid ratio… but is it meant to be this way? Well, either, it’s great and the whole family loved it! Thanks! I confirmed with my niece in Brazil (that’s why it took me a little while to get back to you), and all measurements are right. 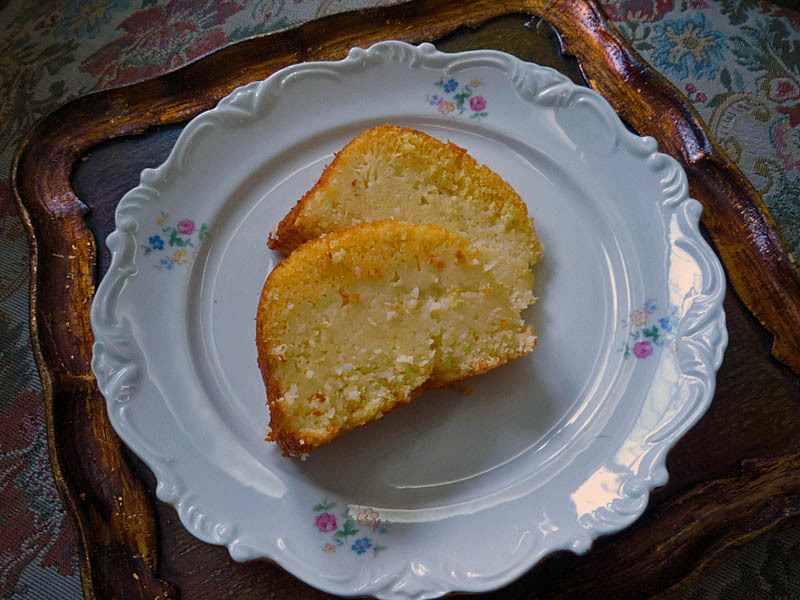 Now, I STILL have to make this cake with ingredients found here in the US to check if by any chance they are behaving differently – that’s quite possible. A friend of mine made it and told me he thought it was a bit too liquid, but ended up ok. Maybe some adjustments would be necessary. glad you like the cake anyway, but maybe there is room for improvement to make it perfect! I finally got this from a Brazilian blogger friend of mine who lives in California and cooks a ton of Brazilian food here in the US. se voce puder me mandar a receita, sei que nao tem receita fixa, mas se voce me der uns “pointers” eu quero fazer sim. Voce acha que daria para usar buttermilk como coalhada?